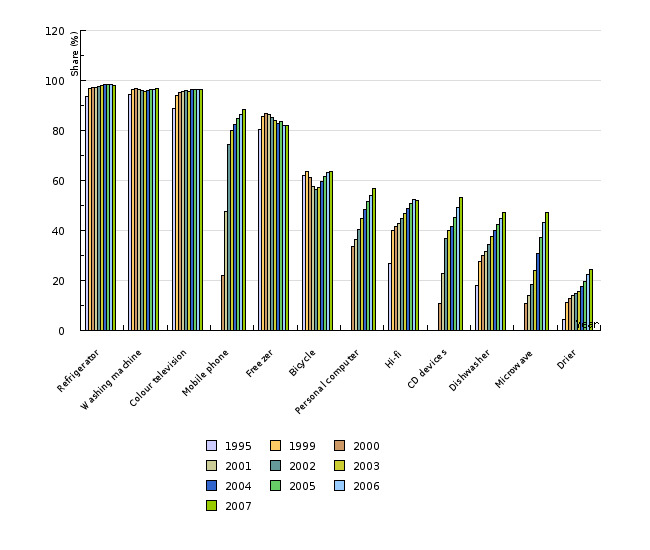 Household electricity consumption increased in 2007 and amounted to 3,000 GWh. 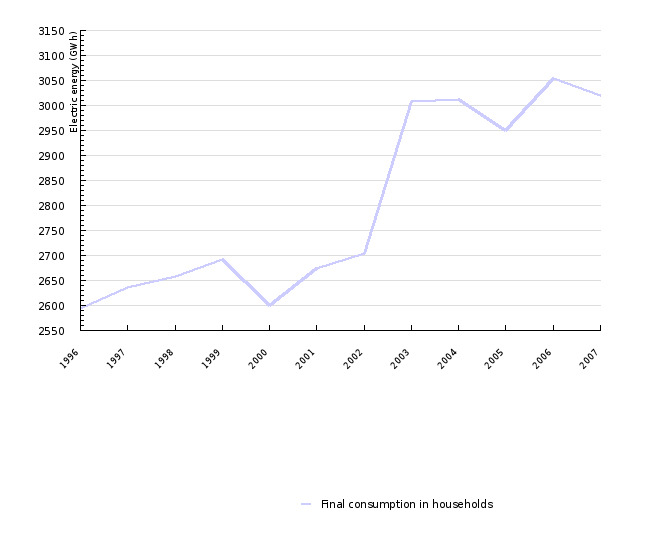 The share of households equipped with electricity-consuming appliances is also increasing. Among these are, for instance, dishwashers, clothes dryers, mobile phone, CD players, microwaves, and personal computers. Despite the improved energy efficiency of some appliances, electricity consumption has not decreased, as the number of household appliances continues to increase rapidly, which also contributes to excessive quantities of waste. The indicator shows the trends of household electricity consumption and the changes in household equipment with regard to electricity-consuming appliances. To establish a framework for specifying the requirements for environmentally conscious design of energy-consuming products, and to ensure a free flow of these products on the internal market of the European Union. Most impacts of electricity use result from its production. However, consumers can influence the selection of the electricity source, as on the basis of a 2003 regulation, all companies are now required to provide details of the sources of electricity (i.e. fossil fuel, nuclear, renewable sources) being delivered to costumers. In the EU, companies producing and distributing electricity are increasingly marketing electricity from renewable energy sources. Consumers can reduce the impacts more directly by reducing electricity consumption, thus also by using more energy-efficient appliances. In using numerous electric and electronic household appliances, particular attention should also be paid to the critical environmental impacts arising from disposal of waste. According to the data provided by the Statistical Office of the Republic of Slovenia, household electricity consumption is increasing in Slovenia. Between 1996 and 2002 it increased by 4%, which was followed by another increase, by 12 percentage points, in the period from 2002 to 2003. Consumption stabilised after 2003 and increased by around half a percentage point between 2003 and 2007. Since 1990, the share of households equipped with energy-consuming goods has been growing. The main increase is in the number of households equipped with a dishwasher, HI-FI music devices, clothes dryers and other products that became widely used by households in 2000, such as mobile phones, CD players, microwaves, and personal computers. For instance, only 22% of households owned a mobile telephone in 2000, but by 2007, this percentage had risen to 89%. In the same year, more than 95% of households owned a refrigerator, a washing machine and a colour TV. More than 80% of households had a freezer and a mobile phone, and around half of all households owned a personal computer, a HI-FI music device or a CD player. To continue, somewhat less than half of all households owned a dishwasher and a microwave. Around 25% of households also used a clothes dryer. Energy labelling of household and other appliances presents one of the instruments envisaged for achieving final energy savings provided for in the National Energy Efficiency Action Plan for the Period 2008-2016. Similar to Slovenia, other EU countries are also witnessing an increase in the share of households equipped with electric and electronic goods. Energy consumption is increasing despite the improvements made to the above-mentioned equipment. Various studies showed that despite the improved energy efficiency of appliances by a factor of 2 to 3, total household electricity consumption has increased in the last few years, mainly due to increased ownership of household appliances. The ‘reverse effect’, when consumption of energy does not decrease despite numerous improvements, has been observed with electronic devices, such as TVs, DVD players and personal computers. On average, the European household has noted an increase in the total energy consumption attributed to these electronic devices, as many households own two or more televisions and personal computers. In addition, the growing number of electric and electronic equipment does not only consume energy but also generates waste.